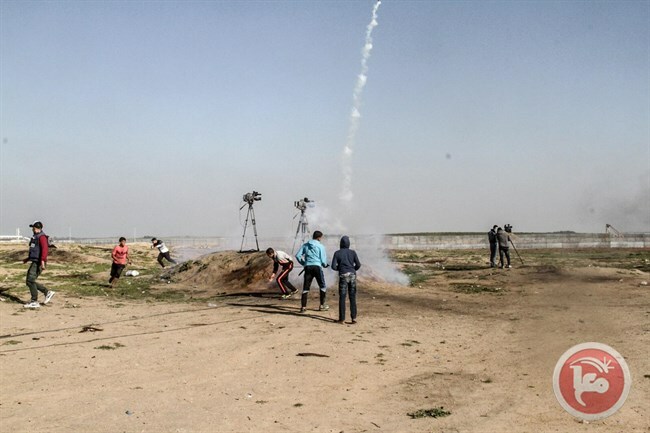 GAZA CITY (Ma’an) — At least 30 Palestinians were shot and injured, while dozens of others suffered from tear-gas inhalation, as Israeli forces suppressed protesters along the eastern borders of the besieged Gaza Strip, on Friday. The Palestinian Ministry of Health in Gaza confirmed that 30 Palestinians were shot and injured with Israeli live fire, while dozens of others suffered from tear-gas inhalation, including a number of health workers. The ministry stressed that Israeli forces targeted and opened fire towards medical trauma stabilization points and ambulances, east of al-Breij refugee camp, in central Gaza, and east of Khan Younis, in southern Gaza. Israeli forces fired live ammunition, rubber-coated steel bullets, and tear-gas bombs during the protest. Thousands of Palestinians gathered alongside the eastern borders of Gaza to participate in the 51st Great March of Return protests in attempt to break the ongoing Israeli siege.